E-cigarettes get touted as a lesser evil to smoking. But when it comes to young people and respiratory conditions, the air gets murkier. First published in Allergic Living magazine; to subscribe click here. SMOKING rates may be on the decline, but the use of e-cigarettes – those little devices that often contain nicotine and flavored vapor – is rapidly growing. Particularly among teens and younger adults, the popularity is skyrocketing. But are they safer than traditional cigarettes? And what about for those with asthma, whose sensitive airways cannot tolerate even secondhand cigarette smoke? Are they any better off with or around e-cigarettes? Allergic Living turns to the experts in the quest for answers. An e-cigarette is a small battery-operated device that produces an aerosol, or vapor, that is inhaled. The user inserts a cartridge of a liquid mixture, typically propylene glycol or vegetable glycerin, flavoring and often nicotine, into the device. When heated and then cooled, the liquid becomes an aerosol. Statistics show that a rapidly growing number of users are taking up “vaping.” According to the U.S. Food and Drug Administration (FDA), more than three million middle and high school students were current users of e-cigarettes as of 2015. That’s up from an estimated 2.4 million in 2014. As well, 16 percent of high school students and 5.3 percent of middle schoolers were users of e-cigarettes in 2015, “making e-cigarettes the most commonly used tobacco product among youth for the second consecutive year,” says the FDA. According to a 2016 review of e-cigarette use, published in the New England Journal of Medicine (NEJM), about 1.8 percent of American adults in 2010 reported having used an e-cigarette “at some time.” By 2013, that figure jumped to 13 percent. The paper estimated that global sales of e-cigarettes will hit $10 billion in 2017. In the summer of 2016, a “deeming rule” came into effect in the U.S., amending the federal Tobacco Control Act to bring a number of products, including e-cigarettes, under the FDA’s regulatory authority. The changes, which are being phased in over a number of stages, include prohibiting the sale of e-cigarettes to minors, requiring warning labels (much like cigarettes now carry) and calling for manufacturers to register with the FDA. The changes still allow for state and civic governments to enact their own laws governing e-cigarettes, including where they can and cannot be used. But extensions have been granted to some key parts of the new guidelines, including the provision that e-cigarette manufacturers submit formal product applications to the FDA. The applications will allow the FDA, for the first time, to evaluate the ingredients, safety, product design and potential health risks of e-cigarettes. They were to be required by November 2018. Then in July, FDA commissioner Scott Gottlieb announced that deadline was being pushed ahead until August 2022. While government moves slowly toward some regulatory control of e-cigarettes, research into their health safety is still in its infancy. Dr. Chitra Dinakar, allergist at the Stanford University School of Medicine and co-author of the NEJM e-cigarette review, breaks users into two categories when discussing vaping’s potential health impacts. One group is smokers who may consider vaping as a way to cut down on the use of tobacco cigarettes or to quit entirely. The other is users who have never smoked, particularly adolescents and youths. On whether an e-cigarette is an effective smoking cessation aid, the research is mixed. Observational studies seem to suggest that e-cigarettes may help smokers to reduce their use of tobacco cigarettes. However, in the “ideal study,” as Dinakar puts it, a randomized trial in which participants were given either nicotine patches, e-cigarettes with nicotine or e-cigarettes without nicotine, there was no statistically significant difference in the quitting rate among the three groups. Dinakar says there is cause for concern about the exploding popularity of e-cigarettes, particularly among young people, and what that means for their health and future tobacco use. Many physicians contend e-cigarettes could be a gateway to other tobacco products, but there is some dispute in the evidence to date. In a study of more than 5,000 high school juniors and seniors, researchers in the University of Southern California’s department of preventative medicine found that e-cigarette users were six times more likely to start using regular cigarettes compared to those who had never used the devices. The link between e-cigarettes and subsequent use of tobacco cigarettes was “stronger” among those who said they had “no intention of smoking” when the study began. The study notes that there are “several plausible mechanisms” through which e-cigarette use in adolescence may lead to tobacco use. 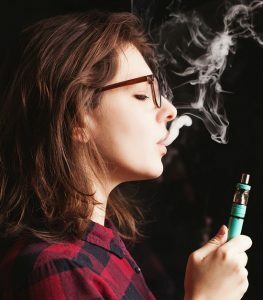 The flavoring may desensitize teens to the effects of the nicotine, which they may also be growing addicted to; the device itself may appeal to youth who are always looking for the next technology to embrace; and vaping appears to be normalizing “smoking-like behavior” that had been marginalized in recent years. But the gateway to tobacco argument is by no means settled. A review of e-cigarette research by scientists at the University of Victoria in British Columbia, Canada concluded that e-cigarette use does not, in fact, contribute to tobacco use later on. The researchers note that four population surveys reveal that rates of tobacco use among youth declined as the use of vaping devices increased. Two other studies found that, in groups of adolescents who were legally able to purchase e-cigarettes, the rate of tobacco use was lower compared to groups who were barred from purchasing e-cigarettes. These researchers also wrote that because many youths use e-cigarettes that do not contain nicotine, the theory that they become addicted to the substance is dubious. Since there’s little research evaluating the potential impacts of the levels of nicotine and other chemicals in e-cigarettes, the jury is still out on the question of health safety. The University of Victoria researchers point out that e-cigarettes do not contain tar and don’t have about 61 of 79 known toxins found in regular cigarettes. Indeed, the U.S. Surgeon General has concluded that aerosol from e-cigarettes contains not only potentially harmful chemicals, but chemicals that are known to be harmful, as well as small particles that can be inhaled into the lungs. In addition, chemicals used in the liquid that is heated to produce the vapor, such as propylene glycol, are approved for use as food additives and considered safe for human consumption. Yet, the safety has not been proven when these chemicals are heated to high temperatures and inhaled, as occurs with vaping. Dinakar points out that asthmatics, who smoke have more symptoms, greater difficulty controlling their asthma and more asthma attacks compared to non-smokers, and switching to e-cigarettes has been linked to improvement in their conditions. But there’s more to the story. Asthmatics are susceptible to all sorts of chemical irritants that can trigger inflammation in the airways. “Their airways are hyper-reactive and therefore inhalation of the high-temperature vapor could trigger bronchial spasms,” the expert says. While there is no hard evidence about the impact of e-cigarettes on those with asthma, that will soon change. Casale has applied to the National Institutes of Health for a grant to study the acute and chronic effects of e-cigarettes versus combustible cigarettes in patients with asthma. A challenge facing researchers is the wide range of e-cigarette products with a myriad array of liquid mixes, so there is seldom consistency in the vapor that’s produced. That lack of consistency will make it challenging to draw conclusions that can be applied broadly to the e-cigarette market. While the risks from that secondhand vapor exposure have yet to be determined, with asthma, such effects are usually magnified when compared to the general public. Casale and Dinakar note that what research does exist suggests that e-cigarettes may be safer than tobacco cigarettes for smokers who intend to quit smoking. That said, there’s still no data on the implications of vaping for non-tobacco smokers or for smokers over the long-term.